Supermoto motorbikes are much loved by those who enjoy riding both on and off the road, which is why supermoto motorcycles are becoming more frequently used. Allowing you to use just one bike to commute to work and to have fun on the dirt tracks at the weekend. Insurance prices for supermoto bikes can be through the roof, with many insurance companies even refusing to cover motorbike use that is not on the road and others viewing the off-road usage as a higher risk and therefore largely increasing your premiums. 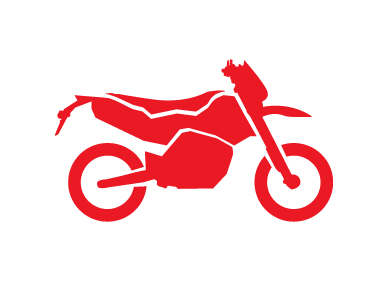 If you are new to motorbikes and have zero no claims discount Bikesure can still offer you excellent rates, we also offer rates to convicted riders, whether it's just for one conviction or many. With access to a huge range of insurance policies to cover your supermoto bike Bikesure can be sure to cover you insurance requirements at a good price. If you have more than one bike, we can also offer discounts with multi-bike policies. Read our key features for more benefits from insuring your supermoto bike with Bikesure. Full range of cover options including Comprehensive, Third Party Fire & Theft, Third Party Only, Fire and Theft Only or Laid Up Cover. To qualify for road risks cover, your bike will need to be road legal. There are a wide range of discounts available to owners of supermoto bikes, many of which are only available on the phone. Supermoto owners can get our best deals by calling us on the phone - that's because we can take individual circumstances into account to reduce the price you pay. Our highly trained staff can take and less rigid approach than a computer, and answer any questions you might have and advise you on the features available from your policy. I've got the added bonus of being able to change from road wheels to off-road wheels for green laning! I was surprised that a lot of insurers didn't seem that interested in covering my bike having this option unless they knew which wheels were on the bike. Other issues seemed to be that with it being a Supermoto and only having daylight M.O.T. I spoke to Bikesure and they were absolutely fine with it. Carl is a 42 year old sales assistant from Wales. He has just purchased his new toy, a 2007 KTM 690 SM worth £2,600. He only does 2000 miles a year as he only takes it out when the weather is nice. Because he hardly uses the bike, Carl wanted to pay as little as possible for his insurance whilst getting a good level of cover. In the end he obtained insurance, and as a bonus he got £100,000 worth of free legal cover on top! Carl only pays £174.60 for comprehensive cover. Lenny is a 25 year old butcher from Leighton Buzzard. He has owned his 2009 KTM 990R SM for 1 year. He values his pride and joy at £5,000 and he keeps it stored away in his garage at home. At the weekend, Lenny loves nothing more than getting out on the twisty back roads where he lives. Lenny is only 25 years old he has been finding lots of prices that are out of his price range, even though he has 2 years NCB. Lenny only pays £214.20 for TPFT cover.